Okay, so first off, I'm not hosting dinner parties or anything, but I am, to the best of my ability, keeping myself and my girls busy in what is basically an empty house. Of course we have a card table, a couple of folding chairs, mattresses to sleep on, and a baby swing. . . but if we didn't bring it in our suitcases or purchase it since we got here, we won't have it until our household shipment arrives in about two weeks. The joys of an international move. So I'm cooking out of two sauce pans and a skillet we picked up at a thrift store. . .where we also got a very sweet children's bench (picture included) for $15. That's been interesting. 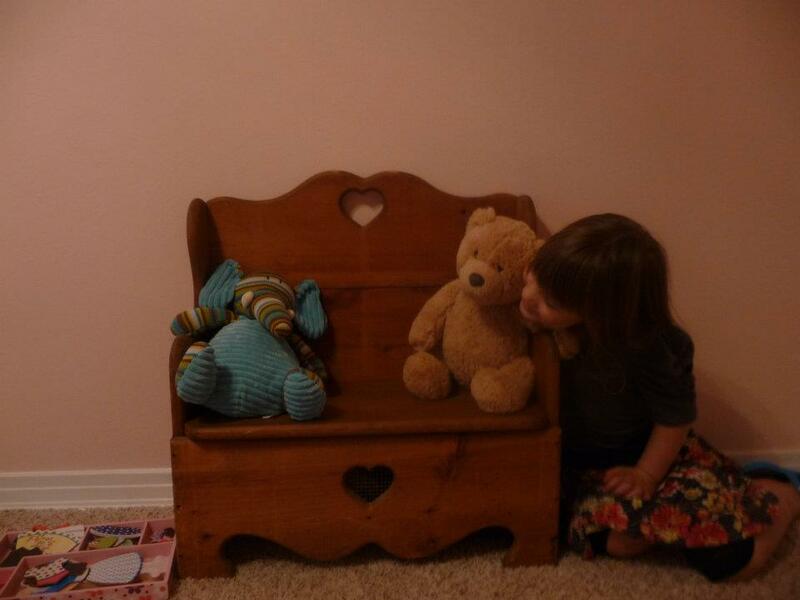 Oh and Coryn only has a handful of picture books, two stuffed animals, one Melissa and Doug Dress Up Doll, and four Barbies. . .which would probably be enough if she also had some friends, but all her friends were left behind, a point she has brought up a few times. I'm sure we'll make new friends soon enough, but it isn't like Iwakuni where we could hang out at a play park next to our building and eventually someone would show up. I haven't even seen a play park, I guess because people here have yards or something. Matt put an offer in on this house with a condition that we be allowed to move in before closing and the process was relatively quick after that. I only saw pictures online, so I had to take his word on how nice this place was. . .and it is crazy huge, as far as I'm concerned way more than a starter home. The price was actually lower than three bedroom homes we'd looked at, but still, five bedrooms and three baths is a lot. Matt thinks its because it was an older home with a few quirks, but the previous owners had done a recent kitchen and bathroom remodel and while it needs little fixes and changes here and there, it's nothing but weekend projects . . . unless Matt has his way. He wants to expand the master bath which is small for a master bath. He's probably right in that it would increase our property value and make the place easier to resale when the military inevitably moves us again, but it's not a project I'm looking forward to undertaking, and I'm going to subtly encourage him to put it on the back burner. So, since there isn't a ton to do in our empty house, I'm relying a little bit on Nick Jr's website to entertain Coryn and the ceiling fans to entertain Claire. Claire loves ceiling fans, and pretty much every room here has one. I just pick a room, lay her in the middle of it, and turn the fan on and she'll lie there, gaping and cooing at the spinning blades. I do have an anxious Mommy image in the back of my head of a fan falling on her, but I know that's just stupid. .. it is stupid, right? As for me, I'm doing little projects around the house, sweeping the floors every day (no vacuum but the living room is hardwood and the kitchen tile), wasting time on the interwebs watching TV shows (caught up on Mythbusters this morning. . .I really want to try living on a deserted isle with only duct tape now), and cooking things that I can with my limited materials. Last night I made a chicken cacciatore which turned out well but I hadn't thought of how difficult it would be to eat off of disposable plates and with plastic flatware. We managed, but tonight I'm doing tortilla wraps. Less messy. I also had forgotten that I didn't have a can opener. Matt managed to open a can of chicken broth and one of diced tomatoes using a pair of pliers. Yay, Matt! Oh, and I'm finally composting! One of the first things I did was get a plastic garbage can, poke some holes in it for ventilation, and voila! Compost bin! That's been fun (dang, I just called composting fun. . . I'm so weird). I also got creative with french toast for lunch today. I didn't have anything to measure with so I eyeballed milk, brown sugar, and cinnamon (plus an egg, measuring wasn't an issue with that) for the coating. . . but then I couldn't get the syrup I'd bought just for this meal open (considered asking the repair man who was doing our termite inspection outside at the time to open it for me, but that felt awkward), so I used honey and a dollop (I don't get to use that word very often, dollop, dollop, dollop) of honey flavored Greek yogurt because I'm addicted to Greek yogurt. I generally chop up an apple or some other fruit and use it to eat it with instead of a spoon and have like three servings a day if I can find it on sale. Coryn declined the Greek yogurt when offered. Yum, yum, creamy. Probably not that bad for me, either considering it wasn't a lot of sugar and I used yogurt instead of butter. . . at least that's what I'm telling myself. Anyway, Florida is nice, but if it is this hot in April, I'm kind of worried about the summer months. We actually went to the beach last weekend. I didn't have any beach clothes (no shorts or swimming suit) so I put on a knee length sundress and only waded a bit. Coryn, however, had insisted on me packing her swimsuit when we were leaving Japan and I indulged her (at the time our destination was Oregon in March, not exactly swimsuit territory). . .and that paid off. She went crazy for the water. I went crazy for the dolphins I caught sight of when we were driving over a bridge on our way to the beach (real dolphins!). I thought one was a shark at first because all I saw was the dorsal but I didn't say anything because I thought Matt wouldn't believe me and I didn't want to be the girl who called shark, but then a few seconds later, the "shark" jumped and I was like, "Oooh! Dolphin! Dolphin!" Matt said, "It's probably a manatee," but I know dolphins. That was a dolphin, in the wild! A real dolphin! Did I mention a dolphin? One more jumped a moment later and then we were off the bridge. I didn't see any at the beach, however, which is too bad because Coryn never got a look at them. I'm sure we'll get a chance to again if they are really here that close to shore and everything, but I really wanted to watch them for longer (the bridge wasn't exactly friendly towards pulling over and watching or else I would've suggested stopping there for a few minutes). At the beach, Coryn played like crazy. Claire stayed in her car seat covered up for most of it, and Matt went for a run. It was a little windy and unlike in Oregon where beaches consist primarily of rocks, Pensacola beaches have really fine sand that sand blasts you when the wind picks up. I know they are proud of their white sand beaches, but come on! Okay. I'll give them that they have a better climate for their beaches and the water is more wading friendly but I will defend the Oregon beaches for beach walks. Much more scenic and interesting. That said, it's going to be fun being able to go swimming pretty much whenever we want to this summer. Coryn and myself in my Old Navy dress I bought just for the occasion (Okay, I bought it because I had a coupon. . .but it worked out). Claire chills out under cover. So that's all I can think of to say so far. I could mention the trip from Oregon to Florida, but it was pretty uneventful. Coryn actually slept most of the first flight and Claire whined a bit but got over it. There was one incident in Atlanta (where we had a connecting flight) where I got a bit frazzled trying to figure out what to do with Claire while I went to the bathroom where Coryn looked at me and said, "Are you sad, Mommy?" (I cry easily and tear up at the slightest provocation). I said, "No, kitten, just aggravated." She nodded and said, "You're just a little upset." She can be so empathetic for a four-year-old.